Since I mentioned my sister’s wedding dress I thought it would be cruel to put off a post dedicated to it. My sister Frances married Anthony in February 2010. In pondering what she might choose to wear, my thought was that primarily she should be comfortable and feel like herself. Not forever hoicking up restrictive undergarments or dirtying hems (it was a maze garden wedding), just taking one level of stress away so she could be her calm elegant self. 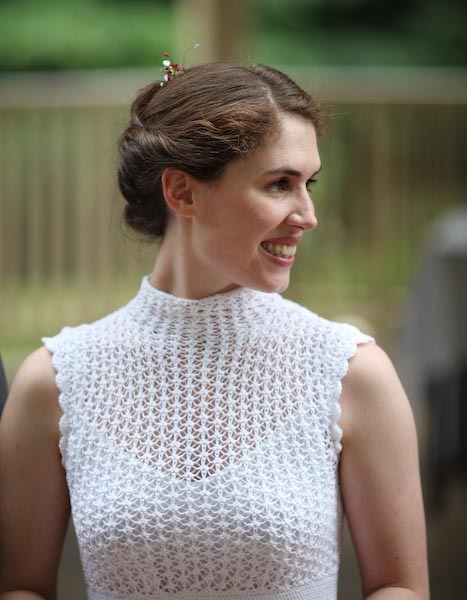 What she settled on was a knitted lacework dress designed by Shirley Paden from an issue of Vogue Knitting magazine (the best knitting magazine I know). It is knitted in Filatura Di Crosa’s Millefilli Fine white cotton. It took me about seven months in total to knit, though for much of that time I wasn’t knitting at all, I was studying fashion full time. At the end of the day what everyone commented on was how relaxed she was. It was just Frances and Anthony having a fun day. Cake lovingly crafted by auntie Anne Applebee. Photography by Robert Crigan. 23 Mar	This entry was published on March 23, 2012 at 6:02 pm. It’s filed under Projects and tagged Cotton, Craft, Dress, Knitting, Lace, Wedding. Bookmark the permalink. Follow any comments here with the RSS feed for this post. Wow, what a beautiful dress. It’s definitely not one that would cause a bride to be sidetracked by keeping things in place. Bravo! It’s the most beautiful thing anyone has ever made me. Thanks so much Sarah, I love you!